Farmyard Bingo is a welcome addition to the Dragonfish family. 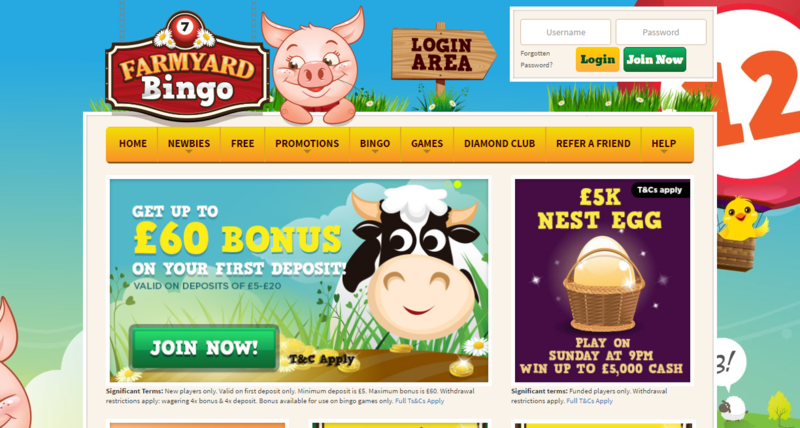 Join Percy the pot bellied pig and a wheelbarrow of gold coins with jackpot games taking place every day, plus win up to £5000 in cash every Sunday with the 5K Nest Egg. The design of the site is brilliant, there are green pastures as far as the eye can see along with a variety of cute animals including cows, sheep, chickens and some cute chicks flying high in some bingo ball shaped hot air balloons. Play at the site for free now with a £5 no deposit bonus. The website itself uses Dragonfish software and is licensed by Cassava Enterprises. The site is very similar to sister sites such as Costa bingo and Sing Bingo. You can find a complete list of identical brands on the BingoMum website. New players are rewarded at this farm with a £5 free bonus just for signing up for an account and providing accurate payment details. This bonus money can be immediately used to try out the free bingo games across the site. There are further bonuses that you can take advantage of too which require the use of a promo code. Carry on reading below to find out more. There are two further bonuses you can benefit from when making your second and third deposits. Be sure to enter the codes listed below when making each payment. 2nd deposit – Enter the code TWO to benefit from a 150% bonus on deposits from £10 to £100. 3rd bonus – use code THREE for a 100% bonus, between £10 to £100. There is £200 up for grabs every day with Percy’s Penny Piglets games. There are 4 90 ball games with each with a guaranteed £50 jackpot! Typing farmyardbingo.com in a browser on your smartphone or tablet will take you straight to the mobile friendly version of this fun and friendly site. New arrivals to the farm can register an account and enjoy all the welcome bonuses whilst existing players can login with existing details and experience all that’s on offer on the desktop version whilst on the move. The bingo tab will present you with 5 options all with their own cute individual pieces of artwork. Choose from regular bingo and free bingo where real prizes are available to both funded and nonfunded alike. There are additional free rooms available exclusively available to those that have just made a deposit. Other options include a guaranteed and a progressive jackpot tab, plus exclusive games for the VIP players only. The majority of games are played across a number of 90 and 75 ball variations whilst one game is for 5 line bingo. Spin whilst you’re winning and play mini games and bingo at the same time! There is also a collection of progressive slots such as Millionaire Genie and Irish Luck along with a game of European roulette and some scratch cards too.